I wanted a great way to showcase all the fresh fruits coming from the market and my garden…strawberries, currents, even a few early blackberries. Let me introduce you to lebneh frozen yogurt. It is PERFECT. Lebneh is strained yogurt, thick and creamy, with virtually zero water to ice up in your ice cream maker. A few drops of orange water, a bit of sugar or honey and some whipped egg whites is all it takes. Dissolve sugar and flower water into egg whites after whipping. Fold in Lebneh and churn in an ice cream maker per manufacturers instructions. Mediterranean Imports is a fun and laid-back work environment. We are a family that LOVES food, so it helps if you do to. We are a small business and consider our employees like our family (for better or worse, haha). We are looking for someone who can make at least a 1-2 year commitment, with excellent customer service skills, who works well with others but can work independently as well. We are located in Cincinnati’s Historic Findlay Market. We offered a competitive salary with scheduled increase. Must be able to live 60 lbs with valid drivers license, car and insurance. Mediterranean Imports is seeking an experienced, hard-working, detail oriented person to fill the position of Prepared Foods/Deli Manager. This position will be responsible for all aspects of operations for the Prepared Foods departments and refrigerated/frozen products within our store. Responsibilities include menu planning, packaging, food preparation and ensuring excellent customer service. We offer a wide range of items including traditional Lebanese fare, hummus, olives, and cheese. Required qualifications include: Experience managing a restaurant or deli, familiarity with Mediterranean foods, excellent communications skills and demonstrated ability to handle multiple demands. A minimum of two years management experience, culinary degree or other relevant experience required. http://mediterranean-imports.com/wp-content/uploads/2017/05/newlogoheader.jpg 0 0 katezaidan http://mediterranean-imports.com/wp-content/uploads/2017/05/newlogoheader.jpg katezaidan2014-01-16 20:11:572014-01-16 20:23:21We're Hiring! Hot sauce made my morning. In truth, you could top a Blue Oven English Muffin with cat litter and it would still taste good. But our breakfast, Brussels Sprouts and Mushrooms topped with egg, inspired by a Joy the Baker recipe, benefited from a few key ingredients from our store, namely Syrian Mix, horseradish from Gene Goldschmidt (the Findlay Market Mustard King), and the aforementioned Tropical Chili Hot and Honey Hot Sauce. English Muffins grace our table every Sunday morning thanks to a terrific bartering arrangement we have going at the market. One of our regular customers trades us the muffins (which I know he waits in a crazy line for) for a handful of cashews, assuming, I’m sure, that the staff, not want to ingest 1200 calories in one sitting, will be inclined to share them. Oh contraire. Seeing as how all day is spent grazing on various treats and taste-tests, the muffins are left on the counter at the end of the night. I casually grab them as I’m locking up the store, like “oh shucks, those silly staff people forgot to take these home”, already planning my Sunday brunch. It’s a terrific system, really. We humans tend to like symbols. Food means home, money means power. An economy, any economy, is simply a trading of symbols. I spent a lot of years as an activist trying to devise a perfect system, one that works on a large scale, that values people over profit. Now, as a business owner, I have to think about profit. It is how I feed my family, and how my staff feeds theirs. This particular trade isn’t the only one that happens on a Saturday, or any day really. We trade sesame sticks for fresh honey candy, eggs for pumpkins, spices for homemade wine. Bartering is one of my favorite things about our store, and one of the many ways The Market is a break from commerce as usual. A lot of times, the numbers of these trades and exchange don’t add up (though I’m not entirely sure, because looking at them gives me a mild panic attack). But in a gift economy, a sharing economy, a relationship economy, they don’t always need to. At the end of the day, if our bellies are full, what does it matter how the got that way? Sautee shallot in olive oil until soft and translucent. 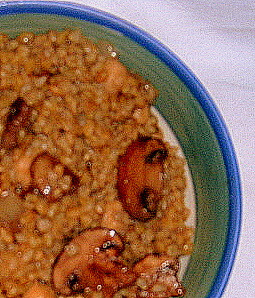 Add Mushrooms and sautee until they are brown and release their water, about 4 minutes. Add Brussels sprouts and cook until tender. Season with garlic powder and Syrian mix. In another pan, cook eggs over easy. Season with salt and Syrian. Toast English muffins. Mix horseradish and mayo. Assemble open faced sandwiches by first smearing the horsey sauce on to the muffin, topping with the Brussels sprout hash, and finishing with the egg and hot sauce. It was a weird, slow week at Market. Call me a new age weirdo, but I’m blaming the harvest moon. Life always gets a little bit strange when the universe’s patterns and predictability are askew, like a great cosmic toe-stubbing. But, If poison dart frogs and the Smokey Mountains teach us anything, it is that the universe is oriented toward the right thing at the right time. Our illustrious weekday staff (known on this blog as F. and J.) spent the extra time clearing overstock shelves and categorizing our olive oil by country, a project that I have wanted to complete for, oh, 2 years or so. I made some serious headway on some of my big ideas, and oh yeah, we sampled anchovies. The first time I had an anchovy was shortly after I started working at the store. We had a can of salt packed whole anchovies go past it’s date (even though food expiration dates mean absolutely nothing), so I graciously volunteered to take them home. That afternoon, this 25 year veteran of vegetarianism, only newly eating fish, spent an entire afternoon ripping the heads off the suckers and tearing out their teensy tiny backbones. They were OK, but they were a little violent for my liking. It was A Tavola Pizza that turned me on to anchovies again, with their white anchovy and fontina pizza. Oh my. That is one of the best things I have ever eaten, anywhere. And I eat A LOT. Now I am obsessed. I can eat them by the jar, or tin, or however they come. It was J. who noticed our Roland anchovies came from two different places, Morocco and Peru. The packaging is deceptively similar, but the products are completely different. My hunch was right. The Moroccans are worlds apart. The Peruvians were mushy, almost like a paste, and, at the risk of sounding obvious, salty. Extremely saltly, with little else in the way of flavor. The Peruvian s are wild caught, which does not always mean better, environmentally speaking. The tin of Moroccan anchovies, however, was picked clean by the end of the day. They were also salty, but the salt amplified their richness. J. shared a wedge of Danish chedder and all three of us rewarded our efforts with a Seamark cracker topped with cheese and a Moroccan anchovy. It made our slow day a little bit fancier.